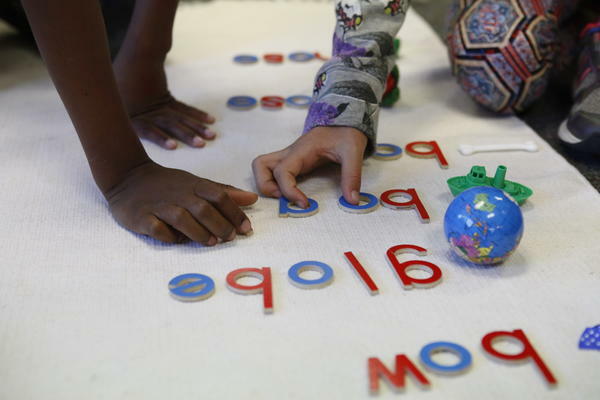 Students work in an elementary school classroom in North Carolina. The numbers are stark: Black students represent 15.5 percent of all public school students, but make up about 39 percent of students suspended from school, according to the report. And it starts early: in preschool. Though Nowicki says her team did not specifically explore the role of unconscious bias in these disparities, "research shows it's clearly a factor," she says. Today's report builds on previous research about bias and the ways in which students of color receive harsher punishments than their peers. The GAO report also adds a new layer: Researchers found that these disparities cannot be explained by poverty levels — they existed regardless of the poverty level of schools studied. "The idea that discipline disparities transcend poverty is something that is pretty important and has not been understood in that way before," Nowicki says. In a statement, Congressman Bobby Scott, a Democrat from Virginia, said he believes the report "dispels claims that racially disproportionate rates of discipline are based solely on income. The analysis shows that students of color suffer harsher discipline for lesser offenses than their white peers and that racial bias is a driver of discipline disparities." The GAO report arrives in the middle of a fiery debate about discipline in schools. 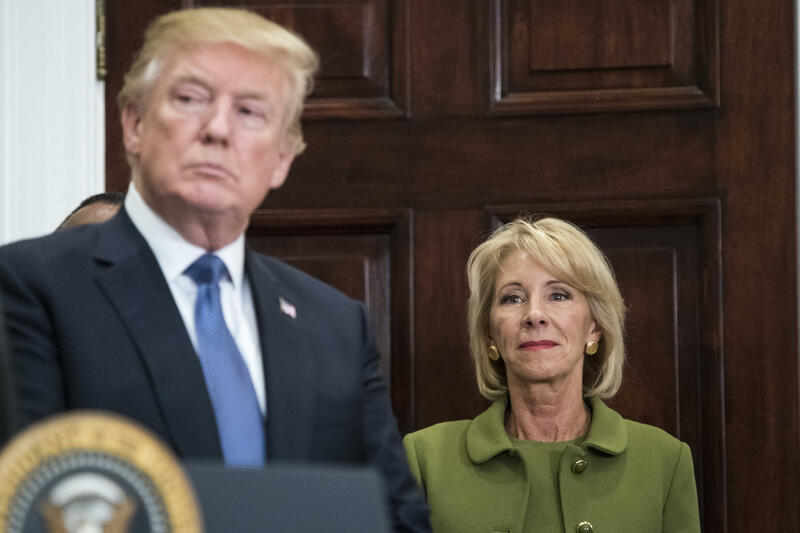 Education Secretary Betsy DeVos met Wednesday with educators as she considers whether she will pull back Obama-era guidance to school districts. In that guidance the administration made clear to schools: These big disparities violate civil rights law and will not be tolerated. Back in 2014, in what's known as a "Dear Colleague" letter, the administration argued that districts should be held accountable under federal civil rights laws — not only if their discipline policies reveal discriminatory intent but also if they "have an unjustified effect of discriminating against students on the basis of race." The Obama administration's conservative critics blasted the letter, arguing it would strike fear into the hearts of district administrators, make it harder for teachers to manage their classrooms and make schools less safe. "We are on a very dangerous road," warned Max Eden, a senior fellow at the conservative-leaning Manhattan Institute, in testimony before the U.S. Commission on Civil Rights in December, 2017. "Maybe [teachers] know more about how to manage their classrooms than the bureaucrats and activists who would blame them for society's problems and accuse them, teachers, of mass racial discrimination." But do teachers feel less safe when their schools invest in more student counseling and alternative discipline strategies instead of suspension and expulsion? No, according to the GAO's Nowicki: "We did not hear anything about teachers feeling less safe when they were using practices aimed at correcting inappropriate behavior in a non-exclusionary way." What GAO did hear, instead, in interviews with officials from five selected districts, is that schools are struggling to handle an increase in disruptive behavior related to trauma and other mental health issues. According to the report, officials at one Massachusetts school "said that many of their students have experienced trauma and this may lead to more aggressive behaviors at the elementary school level, and to more self-destructive behaviors at the middle school level." The Education Department has not issued a response to the report. Black students and students with disabilities are disproportionately disciplined in America's public schools. That is the conclusion of a sweeping new review by an important government watchdog. And NPR's Cory Turner has more. CORY TURNER, BYLINE: The review was done by the Government Accountability Office. GAO researchers found that in the 2013-'14 school year, black children accounted for nearly 40 percent of students suspended from school even though they make up just 15 percent of public school students. Jackie Nowicki led the team of GAO researchers and says these disparities in how children are disciplined were consistent. JACQUELINE NOWICKI: Regardless of the type of disciplinary action and regardless of the type of public school attended. TURNER: But this is perhaps the biggest headline from Nowicki's team. For years, some experts have argued that poverty, not race or racial bias, is the main driver of school discipline disparities. But GAO found black students are disproportionately punished in rich schools and poor schools alike. NOWICKI: We found that these disparities existed across all school poverty levels. And that is something that I think hasn't really quite been presented in that way before. TURNER: And this disparity they found starts in preschool. While Nowicki says her team did not explore the role of unconscious bias, she says other research shows it's clearly a factor. GAO's report arrives in the middle of a fiery debate about discipline in schools. In 2014, the Obama administration issued guidance to schools with a clear message. Big disparities like these violate civil rights law and will not be tolerated, guidance the current education secretary, Betsy DeVos, is now considering pulling back. Cory Turner, NPR News, Washington. (SOUNDBITE OF DEEP CUT'S "MY EDUCATION") Transcript provided by NPR, Copyright NPR.